This brownie is an elaborate affair. It involves a salted caramel filling and a whole bunch of different ingredients I don’t normally keep (heavy cream, sour cream, corn syrup), but the resoundingly positive response to these have been worth every minute of labor I put into these. The texture is rich, fudgy, and just a touch gooey with the help of the salted caramel sauce filling and underbaking on my part. The directive on The Vanilla Bean Blog said to be sparse with the caramel, and due to my temporary shock at how much butter and sugar a 12×9 inch pan brownie contains, I was very sparing with it but definitely could have used more. I’m not that experienced in caramelizing sugar and the caramel sauce could have used more heat too. I generally prefer to convert volume measurements (cups/spoons) into weight (ounces/grams) but this recipe must have been made with the homemaker’s cavalier measurement style in mind – using a 100g = 1/2 cup ratio for sugar meant that this brownie had almost a pound of sugar in a 12×9 pan and I freaked out and hastily retrieved maybe 1/2 cup/100g worth of brown sugar lumps to reduce the caloric content and the brownie still turned out perfect. The fleur de sel and coarse sugar topping really makes the dish, so be sure to hunt down some turbinado sugar or the like. In a medium saucepan, combine the sugar and corn syrup with ¼ cup water, stirring them together carefully so you don’t splash the sides of the pan. Cook over high heat until an instant-read thermometer reads 350 degrees F, or until the mixture is dark amber in color (keep a close eye on the caramel at all times, as it goes from golden brown to black and burnt very quickly), 6 to 8 minutes. Remove from the heat, and slowly add the cream (careful, it will bubble up) and then the fleur de sel. Whisk in the sour cream. Set aside to cool. Place the chocolate and butter in the bowl of a double boiler set over a pan of simmering water, and stir occasionally until the chocolate and butter are completely melted and combined. Turn off the heat, but keep the bowl over the water of the double boiler, and add both sugars. Whisk until completely combined and remove the bowl from the pan. The mixture should be at room temperature. Add three eggs to the chocolate mixture and whisk until just combined. Add the remaining eggs and whisk until just combined. Add the vanilla and stir until combined. Do not overbeat the batter at this stage, or your brownies will be cakey. Sprinkle the flour mixture over the chocolate. Using a spatula, fold the dry ingredients into the wet ingredients until there is just a trace amount of the flour mixture still visible. Pour half of the brownie mixture into the pan and smooth the top with a spatula. Drizzle about ¾ cup of the caramel sauce over the brownie layer in a zigzag pattern, making sure the caramel doesn’t come in contact with the edges of the pan or it will burn. Use an offset spatula to spread the caramel evenly across the brownie layer, leaving about a ½-inch border around the edges. In heaping spoonfuls, scoop the rest of the brownie batter over the caramel layer. Smooth the brownie batter gently to cover the caramel layer. 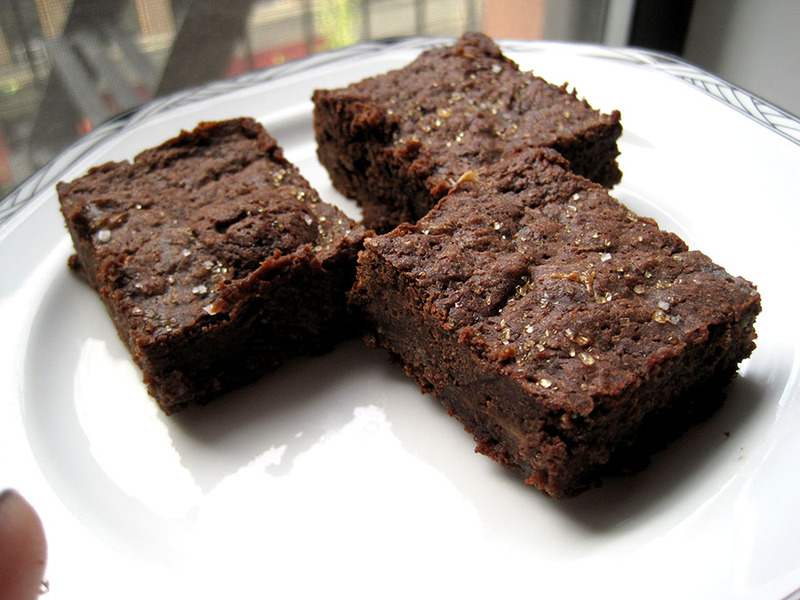 Remove the brownies from the oven and sprinkle with the fleur de sel and coarse sugar. This is how chocolate cake should be. With stout in it. Don’t be surprised if I sneak a spoonful of stout into future chocolate cakes and brownies. After attempting this recipe twice, I think stout is going to be my favorite alcohol to bake with. 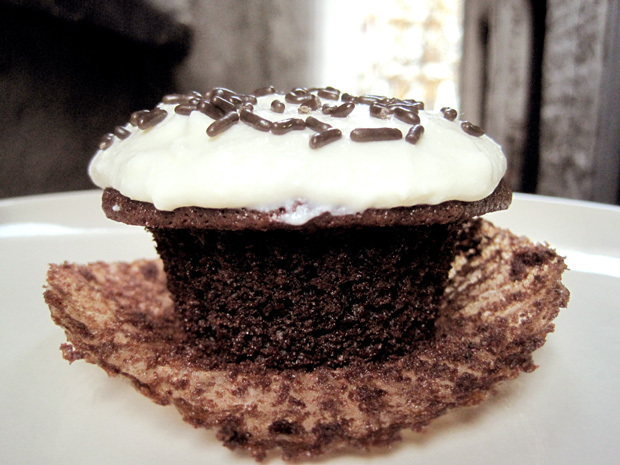 It complements chocolate extremely well, and the half cup that goes into a batch of a dozen cupcakes leaves you with more than enough beer in the bottle to sip as you work along. Baking whilst tipsy is quite enjoyable. 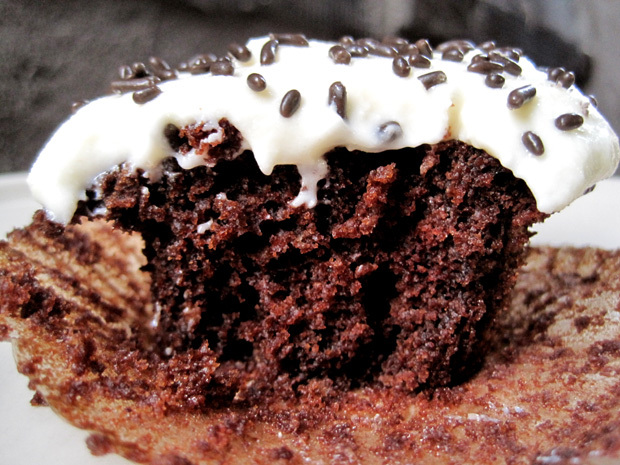 This recipe yields an incredibly moist cake that is also very straightforward to put together. I used a cream cheese frosting for this batch, but I think adding a tablespoonful of Bailey’s to the frosting would go wonderful with the cake. As a testament to how truly awesome this recipe is, I made it twice. In a row. The first time, I used Brooklyn Brewery’s limited edition Dark Chocolate Stout, and it was quite fabulous. Guinness is delicious too, but I would recommend using chocolate stout if you can find some. I also halved the original recipe, so click through if you want to scale up. Preheat oven to 350 degrees F. Line 12 muffin tins with paper liners. Place butter in a saucepan and turn heat to medium. When butter is almost completely melted, add stout and cook over medium until mixture starts to simmer. Reduce heat slightly, add cocoa powder and stir or whisk until smooth. Remove from heat. In a mixing bowl, thoroughly whisk together flour, sugar, baking soda and salt. In a second bowl, using an electric mixer, beat eggs until thick and lemon colored – beat for a full five minutes. Add the sour cream and beat until combined. Add the stout mixture to the egg mixture and stir just until mixed. Add the flour mixture and stir until well mixed. Divide the batter equally among the muffin tins. Bake for 20-25 minutes minutes or until cakes test done (toothpick inserted comes out clean). Cool in pans for 10 minutes, then let cool on a cooling rack. Cream cream cheese and butter together till light and fluffy. Mix in the sugar. Refrigerate after use.